If news about shrinking bee populations gives you a major buzz kill, take heart. Recent research indicates that urban stingers fare better than their country cousins because container gardens offer a greater variety of nectar and pollen year round. 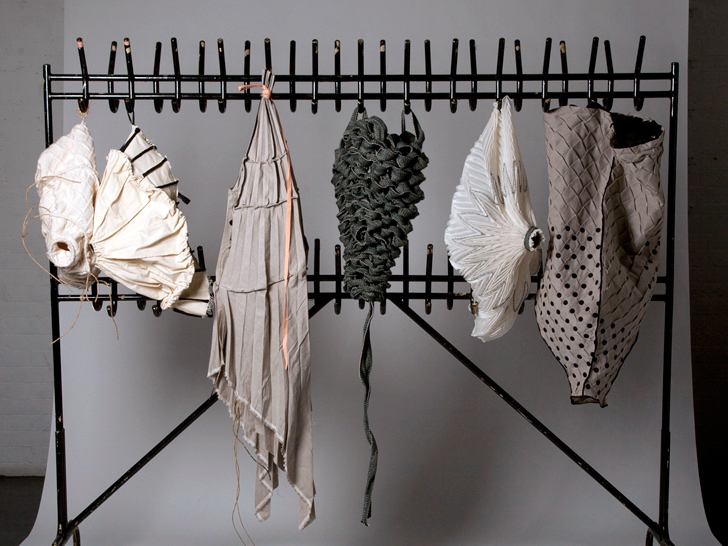 For rural bees seeking to relocate, textile artist Amy Pliszka proposes a series of expandable living spaces crafted from pleated fabrics, ceramics, and wood. The Central Saint Martin's graduate conceived of "Bees Beside Us" by picturing the colony as her client, resulting in a mashup of art and science that not only calls attention to the vital role pollinators play in food security but also puts a fresh spin on our traditional notion of the beehive. To create her “bee brief,” Pliszka applied extensive research on honeybee biology and apiculture (a fancy word for beekeeping) to accommodate the insects’ lifestyle needs. The materials she used had to be natural and biodegradable, for instance, but also water-resistant, breathable, and insulating. Equally important, the fabric forms had to be visually attractive to the bees, which explains their understated beauty. The fabrics she used had to provide water-resistance, insulation, and ventilation while being visually attractive to the bees. Plizka plans to forge a new type of relationship between urban-dwellers and bees. “[I want] to create an innovative design that demonstrates an appreciation of what bees do for us, and our intrinsic connection to them,” she says. To create her "bee brief," Pliszka applied extensive research on honeybee biology and apiculture (a fancy word for beekeeping) to accommodate the insects' lifestyle needs. The materials she used had to be natural and biodegradable, for instance, but also water-resistant, breathable, and insulating. Equally important, the fabric forms had to be visually attractive to the bees, which explains their understated beauty. But her project had a practical component, as well. Pliszka tested her hives on actual colonies from the Twickenham Beekeeping Association, documenting her experience on film. Plizka plans to forge a new type of relationship between urban-dwellers and bees. "[I want] to create an innovative design that demonstrates an appreciation of what bees do for us, and our intrinsic connection to them," she says.